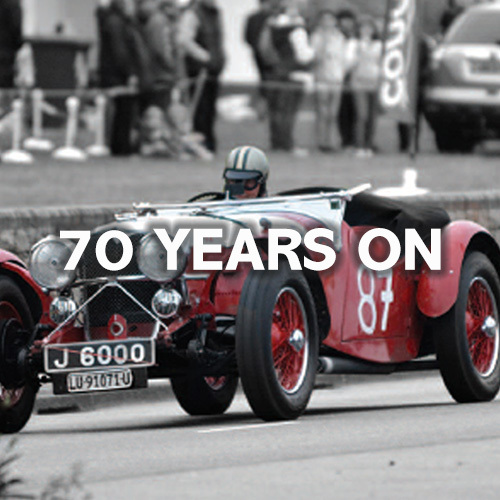 The highlight of JIMF 2017 will be the 70 years of motoring cavalcade on Friday evening. Here we look at John Benett and the history of motor racing in Jersey. John Benett was an active member of the Jersey Motorcycle and Light Car Club, who raced various cars in hillclimbs, sprints and sand races up to 1939. John left Jersey to do his duty, and on his return in 1945 he persuaded the JMC&LCC committee members that his dream of a road race in Jersey was achievable. race that he envisaged. They were enthusiastic to the idea and on February 1st 1946, they came to Jersey to meet up with members of the Club and States Members to outline the needs to make it happen. hoteliers, and many well known names were on the list, without them the event would not have happened. It was originally hoped to run the first race in September 1946, but the States had not passed the law to permit racing on public roads until September. The Royal Court registered the Road Racing Act in January 1947, permission followed from the Defence Committee and the Constables of St. Helier and St. Lawrence. Members of the Junior Car Club being experienced at organising major motor races filled the main officials posts, like stewards, clerk of course etc., and members of the JMC&LCC’s Committees, as well as other jobs, oversaw the marshalling duties. The Royal Court swore in 300 volunteers as Special Constables (with the power of arrest) to marshal the spectators. Reportedly, 10,000 spectators attended race practice, and an amazing 30,000 viewed the race on Thursday May 8th 1947. Races for Formula One cars were run in 1947, 1948, 1949 and 1950. The F.1. teams had started to get more lucrative opportunities so we missed out in 1951, and ran an event in 1952 for sports cars, great racing but unfortunately a financial loss of over £2,000, and with the States not wishing to underwrite any loss the JMC&LCC had no choice but to cancel out any future options. A great loss.